THE first public meeting on flooding in Byfleet was literally awash with guests. More than 150 residents flocked to the meeting – organised by the Byfleet Neighbourhood Forum and championed by ward Councillor John Bond – on Tuesday last week. 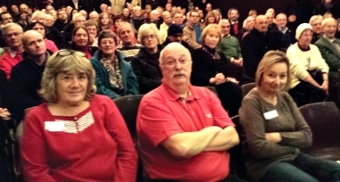 “Such a great attendance highlights just how passionate the occupants of Byfleet are about this issue, and rightly so, given the terrible levels of flooding that many of them experienced first-hand over Christmas 2013, a matter that made the national news and attracted many a film crew,” said Amanda Boote, who is standing as an Independent candidate for Byfleet in this year’s election. First to take the floor was Cllr Bond, who spoke about the key areas affected by inclement weather: demonstrating this by showing pictures that had been taken when the flooding was at its worst over that fateful Christmas period and since. Next up was Ivan Parr from the Environment Agency, who explained that his organisation had carried out work to analyse silt build-up and flow patterns of the River Wey. He told the audience that much vegetation had been in order to lower the risk of flooding in Woking Borough Council’s Neighbourhood Services Officer, Geoff McManus, was also on hand to deliver the local authority’s list of schemes in place should disaster strike again. He stated that a number of properties in Byfleet will have flood defences fitted going forward. “Woking Borough Council have also been forced to review their Emergency Response procedure as a result of the happenings over that fateful festive period,” added Amanda, who confirmed that Thames Water were absent from the meeting. “It was very unfortunate that Thames Water did not attend the meeting, and they will certainly be invited to the next meeting in two months’ time. “The company are inextricably linked to Woking Borough Council on the matter as they are responsible for taking most of the surface-water away, and so it will be good to understand what they are doing to alleviate flooding. THE next public meeting in March will focus on protecting Byfleet’s Green Belt and the Neighbourhood Forum.